A flag offered by "edwinart" (aka eBay Store Edwin's Stuff) some time ago concerned the City of Morris, Illinois (United States): offer no. 160289228324, ended 9 Oct 2008. 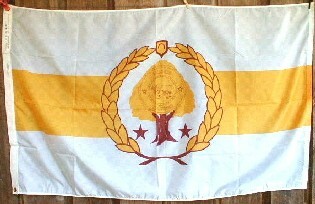 Horizontally divided white-yellow-white, the central stripe interrupted by garland of yellow leaves with maroon outlines placed around a yellow tree with a maroon trunk, at the base accompanied by two maroon five-pointed stars, one at each side. The tree bears the city seal in maroon outline and above the tree, where the garland's leaves almost reach each other, a small shield in maroon outline contains a maroon crescent-like figure, horns pointing downwards.